Another day, another post about a new Chipotle in Indianapolis. 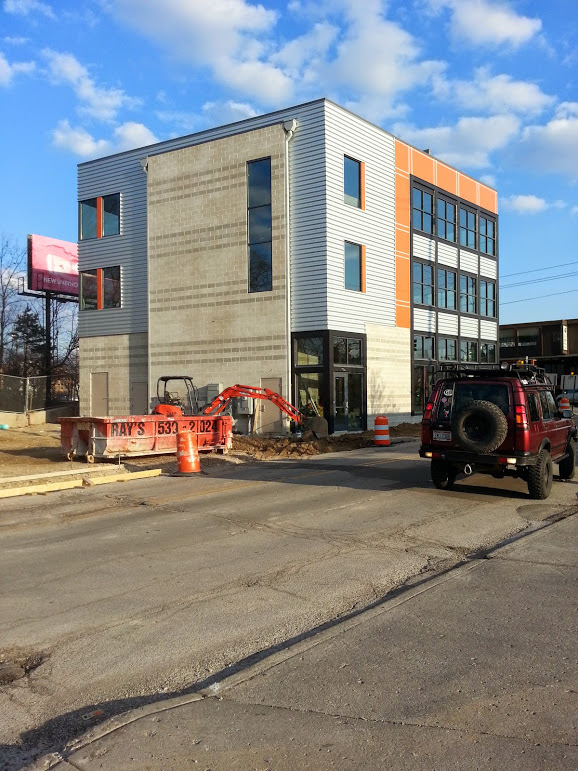 This building replaces a former stand-alone liquor store in Broad Ripple, and it appears to be successful for the most part. And, yes, it will also house a Chipotle, just like the last post that I made. I think it looks great. Fills out an odd sized lot for the most part. 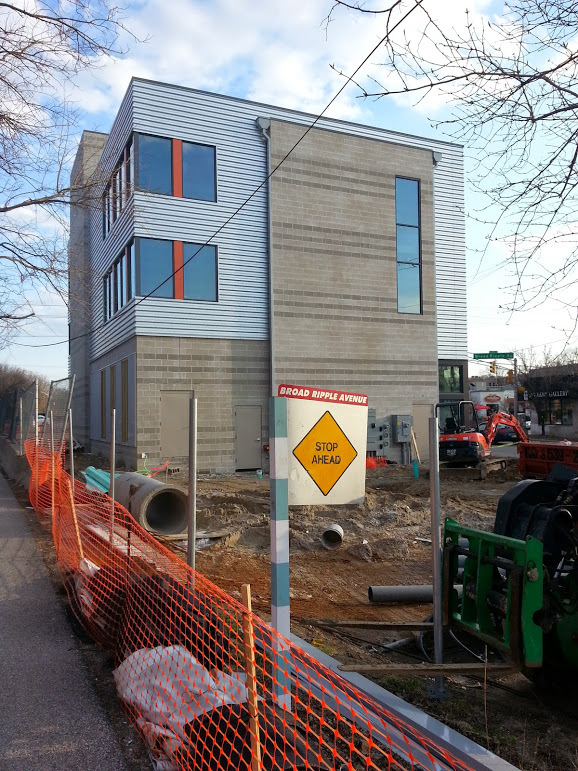 To continue the building to the point of the parcel would probably have diminishing returns. It is a small development on land the developer has owned for years. No need for a mega project, no need for subsidies. I think it looks great, especially as a marker when you’re driving down Broad Ripple Ave. 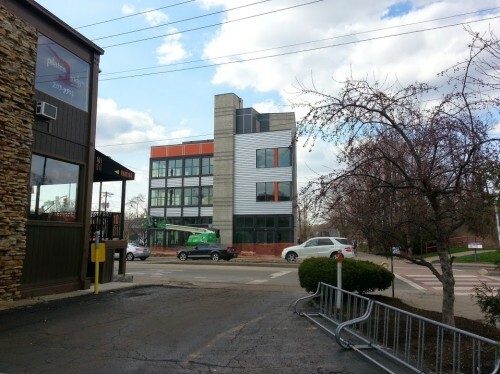 It does seem odd that so many buildings new and old don’t really embrace the Monon at all. On another note, I’m starting to think walkable Chipotles are a solid quality of life indicator – similar to the froyo index. Then again maybe its just that I love Chipotle. Chipotle and Five Guys seem to be booming right now and therefore more willing to go into mixed use buildings. Can’t remember the last McD’s or Wendy’s I’ve visited that wasn’t a standalone drive thru. This would be a good follow up case for Streetsblog or Atlantic Cities on successful apartment buildings with limited parking. How many parking spaces does it have? 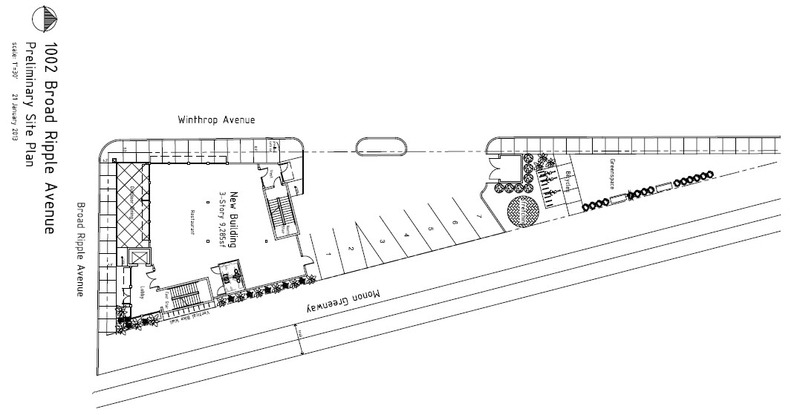 According to this site plan, seven parking spaces. Oh man, I want this in Indy…anywhere in Indy. That is a great looking building. Love it. I’m excited to see some new life going into the village. While I love the charm of Broad Ripple’s Ex-House shops, something about a steel/concrete/brick building really appeals to me. Oddly enough, the McDonald’s on the other side of the trail actually has an outdoor dining and a direct trail spur to its door. It may be stand alone, but it knows what is right next to it! Love it. 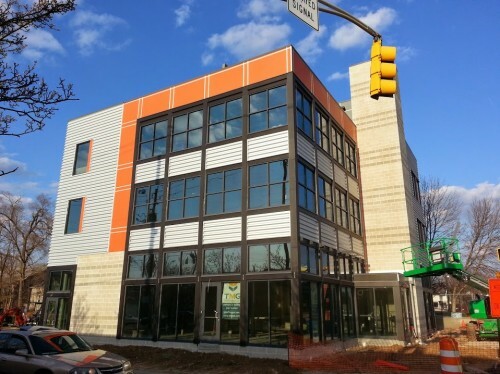 Great infill project. 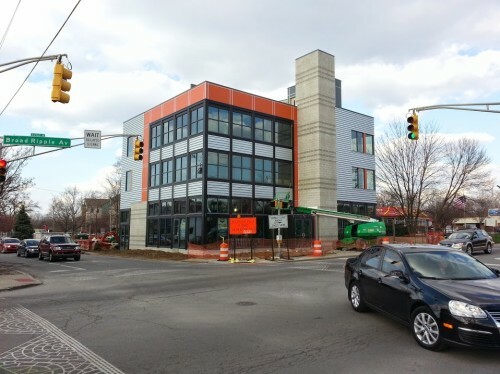 The building will have trail access, wall-mounted bike racks on the trail, a 40′ mural by Big Car, and a stretching area with additional bike racks in the wedge. Unfortunately, two stair towers, a commercial kitchen, and a wall full of meters and service connections in such a small footprint requires some solid walls and we chose to face the glazing toward the Village. We’re also lighting the trail for safety at night and landscaping the easement. Thanks for stopping by for explanation. I think it is a great addition to Broad Ripple. Thanks for posting it Kevin. I appreciate everyone’s feedback. Thanks for the details. Adding lighting to the Monon right at the BRAve intersection is going to be huge for pedestrian safety. I liked the idea of this building since it was announced. Didn’t know that it’d have food and/or retail in it. I remember it being pitched as an office space for self-employed or small firms and what not so I’m assuming that’s what the upper levels are. But I guess if any business could make it work, it’d be a place whose product is incredibly portable like Chipotle. I also think the building itself looks really nice. I’m not the urban designer or artist some of you are so I can’t really explain why I like it. I just do.